I’ve been suggesting in recent months that the Bible is usefully seen as a story in three parts, the very first of which is about the purpose of God to bring in a new spiritual creation, in which his glory would fill all things, through Adam – a purpose which proved abortive because of the temptation of the serpent and the sin of Adam and Eve. If that’s a reasonable assessment, then the whole of the history of Adam’s race (that is, us) has been a story of exile from a world, and a role, that was glimpsed and then lost, and not simply a story of how natural mankind eventually received a gospel promising paradise. This suggests some intriguing insights into “the human condition,” if we look at historical examples of exile. One such example is the famed “Bonny Prince Charlie” – Charles Edward Stuart, the Young Pretender, who tried to oust the Protestant Hanoverians of Britain and restore a Catholic Stuart monarchy through a rebellion based in Scotland. As anyone with Scottish roots knows, it all ended in a military disaster at the Battle of Culloden. Only of course, it didn’t end there for Charles, who ended up in exile back in France, and thereafter back in his native Italy. Charles was born in Rome (and died there), to his father James, the Old Pretender, and presumably grew up to the notion of the Divine Right of Kings to Rule, and of the Divine Right of the Stuarts to be those Kings. And so, on his arrival to lead the revolt, disgruntled Scots rallied round him and he was, for a brief span, a revered hero – until the march south ran out of steam. After Culloden he travelled from hiding place to hiding place inspiring tragic ballads wherever he went, until he safely made it to France… and spent the rest of his life drinking heavily, beating women up and insisting loudly wherever he went that he be treated as royalty – see this account in The Scotsman. Now neither France nor Italy were bad countries – and they were both Catholic which should have suited him. 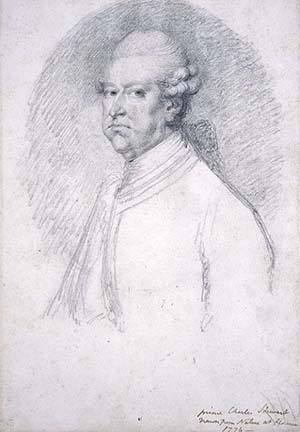 He had money and royal social connections and could have spent a fruitful life as a wealthy resident. But once a pretender, always a pretender, it seems. It was the bitterness of having his claim to kingship rejected by the people he had hoped to rule that he couldn’t adjust to, and he became a wastrel, profligate and drunk who even tried to murder his wife. He even temporarily converted to Protestantism on a secret trip to London to gain the throne at any price, including – according to the Catholic theology of the time – his eternal soul. I see our disordered relationship with this world in a similar way. There’s nothing much wrong with this world, God’s first creation, except us. But we seem in some ancestral way to be aware that we were once chosen to be lords of the whole of a new creation, rather than simply rulers of the creatures of earth, and are deeply resentful that we were exiled from that. The exile of Israel to Babylon is a direct parallel to that of Adam, and another fruit of the same spirit of rebellion. Yet the prophets had the concept of a remnant, and in some cases that remnant was identified as those who had actually suffered deportation to Babylon, rather than those spared. Jeremiah (29:5ff) told them to build houses, settle down, and live quietly as God’s people until the time came for their restoration. Although some did return, in dribs and drabs, 70 years later, theologically Israel remained in exile (see Neh 9:36), and the subsequent history suggests a majority behaved like Sozzled Prince Charlie, filled with violence against each other and insisting to their occupiers that they had inalienable rights to the land. As many of the rabbis still conclude, it was that which led to the final disasters of AD 69-70 and 130. Meanwhile, though, Isaiah’s faithful remnant waited patiently on God to end their exile, a classic expression being Mary’s Magnificat in Lk 1:46-55. That attitude also characterised other “wanderers” in Israel’s history, imcluding paradigmatically Abraham, called to a new land in hope, and yet never allowed actual ownership of any square foot of it, other than his tomb. That kind of attitude, perhaps, is what the New Testament speaks of in respect of the Christian’s relationship to the world. Like Abraham, we are called to the new creation, and have a firm downpayment on it in the glorification of Christ, and in the Holy Spirit. And yet we are still dwellers in the Old Creation, knowing like all Adam’s children the sense of exile from something we once almost grasped.